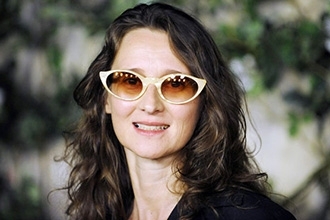 News from The Buenos Aires Herald: Celebrated Argentine filmmaker Lucrecia Martel has had something of a career hiatus following the success of her Award-winning (Havana, Sundance, Berlin) trilogy of movies The Swamp (La ciénaga, 2001), The Holy Child (La niña santa, 2004) and The Headless Woman (La mujer sin cabeza, 2008). After a much publicized – and ultimately ill-fated – attempt at bringing Argentine comic book sci-fi classic El Eternauta to the big screen, Martel is back in the game with her new movie project Zama. Filmmaker Lucrecia Martel and production partner Pedro Almodóvar. Zama is based on the homonymous novel by Antonio Di Benedetto, whose short story Aballay made for an epic, big-budget Western shot by Fernando Spiner in 2010. Set in 18th century Argentina, Zama tells the story of Diego de Zama’s slow upriver trip towards Asunción, Paraguay. “Although I cannot say yet who the actors will be, the film will be shot in the cities of Corrientes and Formosa,” said Martel, who is currently running a film workshop in Asunción. “I once said that thinking of doing a big-budget movie would be demential, that I feel comfortable in the realm of cinéma d’auteur, but Zama is a period piece”. Pedro Almodóvar’s Spanish production studio El Deseo has got Martel’s back since The Holy Child and is listed as the main production company so far, though Zama is still looking for financial backers and is currently in early pre-production process. Martel aims to begin shooting in 2014 with a 2015 release.